Happy New Year! Man, this is my last day of my first blog year. That’s 365 days of posting 3 times a day. I’m celebrating that I reached my goal, not missing one day. Woo Whooo! I know my blog numbering is off. It should say day #365 up there. Where did I go wrong? Oh well, I know I went January 1st until December 31st of 2012, and I’m excited for a new year of Meaningful Mama. I hope you will enjoy it just as much although it won’t be posting craziness like this past year. 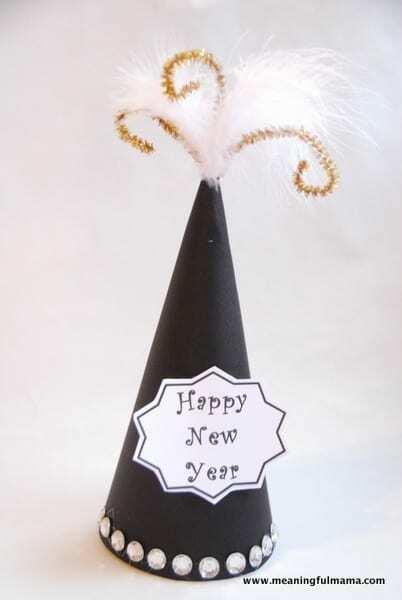 It’s time to introduce you to our final craft of the year – New Years Eve Party Hats. 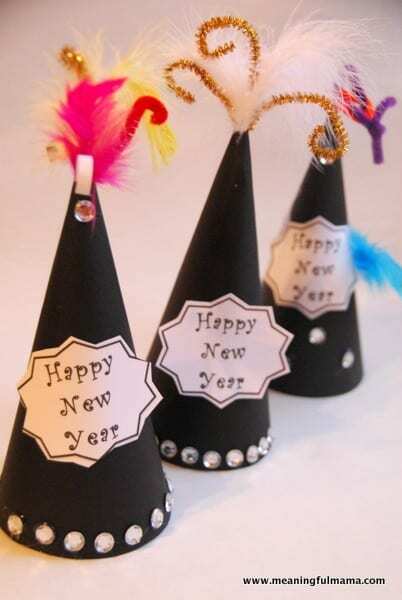 This is a perfect craft for the kids to do at a New Year’s Eve party. You can do it anytime prior to the celebrations too. I made a couple printables for you to make your life easy. 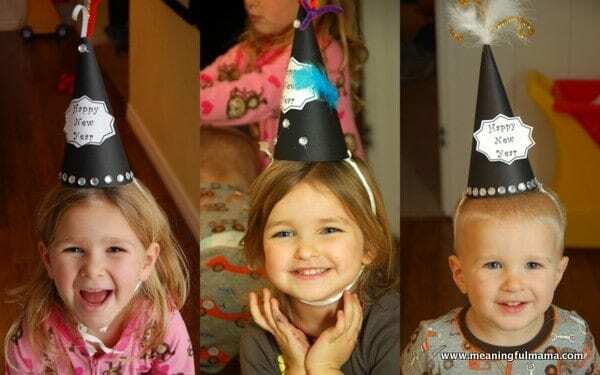 The first thing you will want to do is print out the party hat printable onto card stock. This becomes your template. 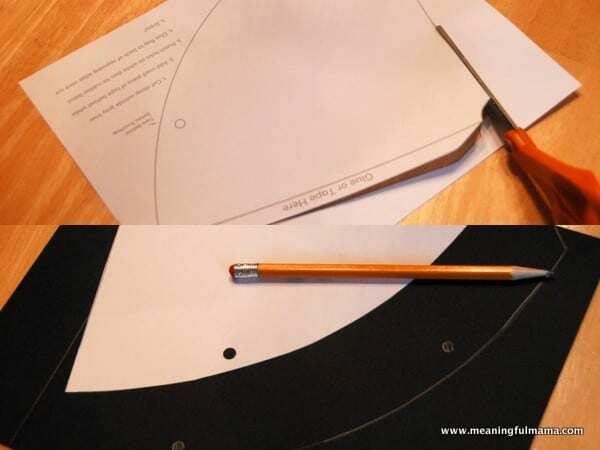 Then, trace the party hat onto black card stock. 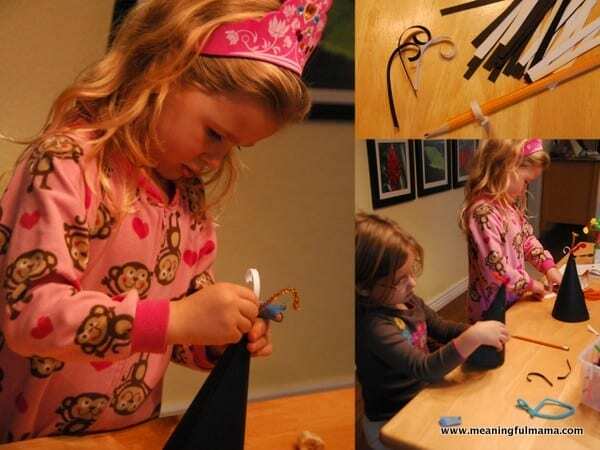 You will want to cut out the black paper hat or have your kids do it. Glue or tape the hat together into a cone. I used hot glue. 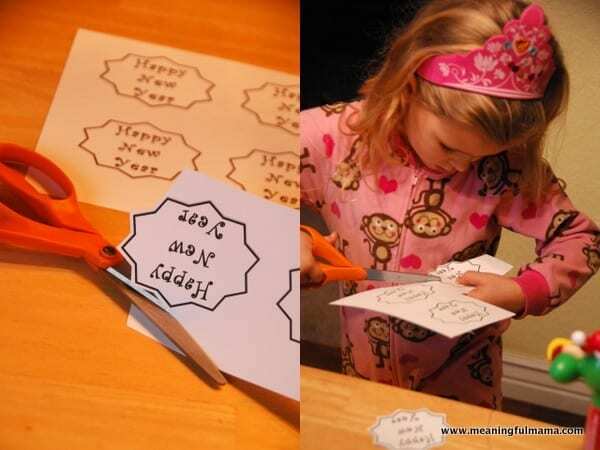 Print out the Happy New Year sign printable, and cut or have kids cut out the Happy New Year logo. Hot glue or tape these on the hat. Have kids chose options and decorate what comes out the top of their hat. You can stick things in and tape inside the cone if necessary. We didn’t find it necessary. We used pipe cleaners, paper curls (made by cutting thin strips and wrapping around a pencil), and feathers. We added some jewel embellishments and a ribbon for tying it around their heads. Previous Post: « Famous Chocolate Refrigerator Roll Cake – Easy & No bake!